Short days that feel very long. December has been so different with all this free time. I've made dozens and dozens of stars and mailed them to places far away. There was a big spike in views and orders after they were featured in Remodelista; yay for that! Also, all presents wrapped already! No real need for Christmas stress this year - maybe I'll now start worrying about getting books done for the Valentine's so I don't get all confused because of this stressless state of mind. This year I decided it was time to take a break from my traditional matchbox art advent calendar and enjoy a more relaxed December for a change. So, this time my calendar is a Christmas present just for V. 24 little presents wrapped in five sorts of kraft and vellum paper, some with embroidered or gilt numbers, some with simple hand lettered or paper cut numbers. Days of dense snowfalls, days filled with the sound of snowploughs. Vertiginous days. All these little long-stitch jotters along with some friends have spent months and months on my desk badly neglected, mostly done, before I finally took a morning off just for taking photos and squeezed these into my schedule. It's most certainly winter here; daylight is scarce and sun a rare guest, so it is not often that light and inspiration (inspiration. who am I kidding? it's all about having or not having the energy at the right moment) coincide. 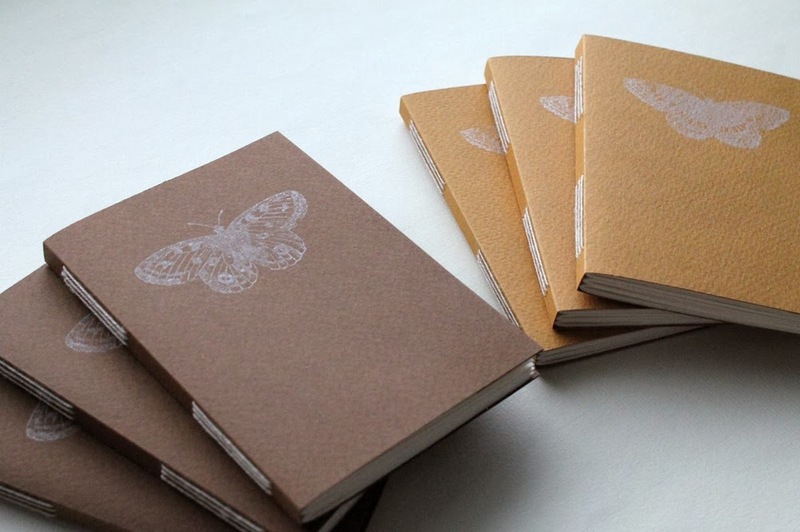 Despite these minor difficulties on their way, these notebooks are now listed on Etsy. Some come in pairs, some individually; all beautifully wrapped (and ready to give away as gifts if you can bear to part with them). I'm feeling a bit surreal today; I've had many good days, creative days, along with a feeling my mind is two inches right from where my head is located. Sometimes that's just how it is and it's alright, but today I just ended up wasting time - precious daylight hours to make things worse - only waking up to action so late I should've gone to bed already but instead I now procrastinate ineffectively (effective procrastination would be too much to ask tonight). Maybe by morning I've had some great revelation and made headway with the newest version of my poetry manuscript. If not, I'll just have to try not to break my printer again tomorrow and spend the day actually writing, making and doing. Two hours after taking this photo and feeling perfectly fine I finally caught V's cold. I was getting confident about dodging it this time but you know my luck. More about these books as soon as my other hand isn't occupied by a kleenex anymore.